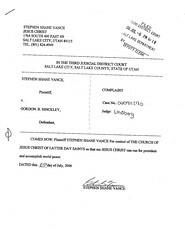 Stephen Shane Vance, with an alias of “Jesus Christ”, has filed a complaint against Gordon B. Hinckley, president of the LDS Church, to gain control of said church. His intent, apparently, is to “run” for president and accomplish world peace. Uh, okay. I just called Judge Lindberg’s office (the judge listed on the complaint) and verified that this is a legit complaint – not some internet hoax. The guy, apparently, is serious about this. I’m just glad that the Church is so true. So true, in fact, that any attempts to stir up dirt against it always results in more interest in the church and more converts.